Taking care of your heater means more than a filter change, each year, investing in heater maintenance in Livermore, Dublin, and Pleasanton, CA can add up to thousands of dollars in savings on repairs and early replacement costs. The team at Superior Mechanical Services, Inc. has a strong reputation in Livermore and hard work to back it up, we’ve been a part of the community since 1948. Being ready for cold days means planning ahead with routine care, and we’d be honored to help you with our professional heater maintenance services. What’s Included in a Maintenance Service? 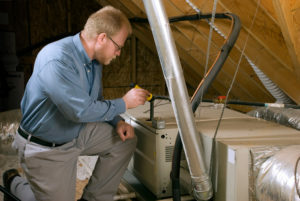 We perform a detailed 18-point inspection and clean and maintain your heater, checking for any potential repair issues. All of our technicians are certified professionals, bringing the friendly approach we’re known for to each visit. We’ll make sure your heater is safe from hazardous carbon monoxide leaks and check electrical or gas connections are working properly. Maintenance includes a thorough cleaning of all the parts inside your heater, getting out dust, mold, pollen, and other allergens so they no longer circulate through your ductwork or cause extra wear and tear on the parts in your unit. The air you breathe indoors can actually be poorer quality than stepping outside, that’s why both air quality and duct cleaning, along with scheduled heater maintenance in Livermore, Dublin, and Pleasanton, CA are important to keeping your home a place of relaxation and safety. Maintenance is not only a way to extend the life of your heater, it helps keep your family safe from carbon monoxide leaks that slowly poison the air. A cold front can come at a moment’s notice, and your heater will be ready with our maintenance services. We recommend maintenance service once a year for your heater to keep it ready at a moment’s notice. While changing the filters is an important step you can take as a homeowner, only a professional can get deep into the heating equipment, cleaning and inspecting it for best results. We’re here to help with superior care and courteous service, so give Superior Mechanical Services, Inc. a call today at 925-456-3200 or toll free 888-544-4111 to schedule your next maintenance service.